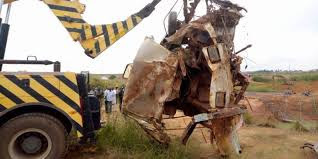 The Nigeria Army has pulled out another vehicle from the mining pond in Dura Du, Jos, where missing Gen. Idris Alkali (rtd) car was found on Saturday. It would be recalled that General Alkali, the immediate past Chief of Administration, Army Headquarters, Abuja, was declared missing on Sept. 3. He was said to have gone missing on his way to Bauchi after leaving Abuja in the morning. 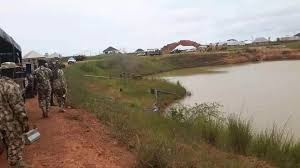 The army said that after a thorough search and investigation, they stumbled on some intelligence that made it necessary to search the water body. Maj.-Gen. Agustine Agundu, Commander of Operation Safe Haven, told a news conference that a Toyoto Hiace Bus with registration number Plateau, RYM 307 XA, was pulled out of the pond, adding that there were more mysteries in the water. He said that the army under the directive of Buratai, was determined to uncover the mysteries. The commander confirmed that there were three more cars in the pond and that the joint operation would pull them out one after the other. He said that there were probabilities that there were other things under the water. Alo speaking, Maj.-Gen. Benson Akinruluyo, General Officer Commanding (GOC) 3 Division, Nigeria Army, Rukuba, said that the army experienced technical challenges in the operation. Akinruluyo allayed fears of the surrounding communities that they would be dealt with after the discoveries. “There is no need for them to fear, however, we have recovered the vehicle we still need to find him or his body. “We are asked to find him dead or alive. The community can tell us where they kept him or his body; we will not stop until we find him or his body,” Akinruluyo stressed.